Any broker will tell you how many successful sales are concluded after the buyer has thoroughly enjoyed a charter on a superyacht. After a week or 10 days aboard, he's had the opportunity to get a feel for the yacht, enjoy all its facilities and appraise the professionalism of the crew before making an offer. Moran Yacht & Ship is offering Feadship's 44.65 metre motoryacht Bella Vita (ex-Madsummer) for charter and sale asking €34.28 million. Built by the Royal Van Lent yard in 2008 as the third in the F45 Vantage series, she's Lloyds classed and MCA compliant. An interior by Sinot Yacht Design accommodates 12 guests in six staterooms and twin 1,055 MTU engines give her a cruising speed of 12 knots._ Bella Vita_ also boasts zero-speed stabilisers, a spa and sauna and a glorious sun deck. The 45 metre tri-deck superyacht Latitude is on the market through Yachtzoo in Fort Lauderdale. Designed by Vripack and built to DNV class and MCA compliant by Russia's Timmerman yard in 2009. 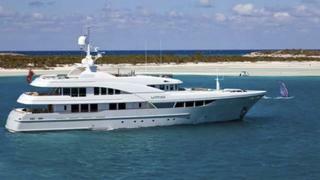 Latitude has an interior by Bannenberg and Rowell accommodating up to 13 guests in five staterooms. Twin 720hp Caterpillar engines give her a cruising speed of 10 knots and a range of 4,000 nautical miles. Located in Monaco, Latitude is asking 14,950,000. The 47 metre sailing yacht Andromeda la Dea was delivered by Perini Navi in 1990 as the ultimate 47 metre sailing yacht. 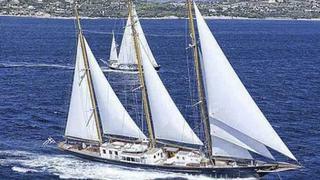 Indeed, she was the first Perini Navi yacht to sail around the world. She had a thorough refit in 2006, including a flybridge extension with Jacuzzi, plus new engines and generators. 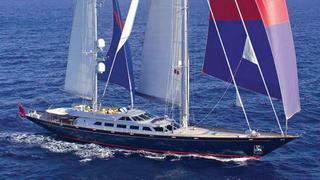 Andromeda la Dea is also now the only 47 metre Perini Navi with carbon roller furling booms. Built to ABS class and MCA compliant, this superyacht accommodates eight guests in a master, two doubles and a twin. Andromeda la Dea is avaible for charter and jointly listed for sale by Merle Wood & Associates and Northrop & Johnson asking €10.5 million. Built by CBI Navi in 2005, the 51 metre motor yacht Alibi can accommodate 12 guests and has plenty of space for outdoor activities. There is a panoramic open deck area with large half-moon-shape sunpads and an extendable table for 12 guests and a bar. Alibi's vast sun deck was entirely refurbished with new furniture for summer 2013. She now boasts Paola Lenti sofas and chairs from the Cove collection, two Dedon Orbit shell chairs for ultimate relaxation, and also offers various shade options including two large parasols and a huge retractable bimini top. The fresh new sun deck layout is complemented by a Jacuzzi, sunpads and air-conditioned panoramic gym. 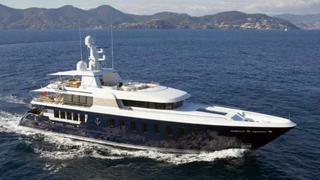 Alibi is listed for charter and sale by Burgess asking €13.5 million. Designed by Robert Clark, the 57 metre classic sailing yacht Fleurtje was built in 1960 at the renowned Dutch shipyard of De Vries Lentsch. Previously know as Carita and then Argonaftis, the current owner changed not only her name when he took possession of this fine yacht, but also commissioned a full refit. Fleurtje has extremely elegant lines. The long overhangs at bow and stern, the rich Awlgrip blue hull and three Douglas fir masts with staysail plan combine into a handsome profile. Her steel hull and aluminium superstructure are in splendid condition having been recently faired and repainted. The acclaimed naval architect Gerard Dijkstra was brought in to optimise sailing performance, thus resulting in considerable speed and handling improvements. Since launch, Fleurtje has undergone four refits and been maintained to Lloyds class standards, all in the aim of rendering her one of the finest three-masted schooners afloat. 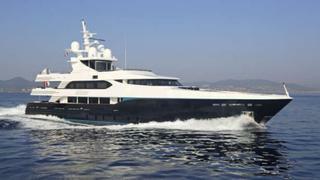 Fleurtje is listed for sale by Fraser Yachts with price on application.